Equilibrium is a special case in mechanics where all the forces acting on a body equal zero. This type of problem pops up in many situations and is important in engineering and physics. This equilibrium example problem illustrates how to determine the different forces acting on a system of forces acting on a body in equilibrium. A block of weight w is suspended from a rope tied to two other ropes at point O. One rope is horizontally attached to a wall and the other is fastened to the ceiling. The angle between ceiling and the rope is 60°. What are the tensions in each of the ropes? Assume the weights of the ropes and the knot are negligible. If the weight of the block is 100 N, what is the tension in the ceiling rope? This illustration shows the arrangement described in the problem. There is another system to consider. The connection between the T3 rope and the block. This system is useful because it relates the weight of the block to the tension in the rope. This in turn will relate the weight of the block to the tensions in the other two ropes. First draw force diagrams for the two systems. The coordinate system shows horizontal to be along the x-axis and vertical to follow the y-axis. Notice T3 and w are the only two forces acting on the block. This is because these are the only two forces actually connected to the block. Let’s start with this system. Group the forces by the coordinate system. For the y-direction, T3 is pulling the block up in the positive direction while the weight w pulls the block down in the negative direction. Since the block is stationary (at equilibrium), the total of these two forces is equal to zero. Since both of these equations are equal to the same thing, they must be equal to each other. Now we have the tension in the first of our ropes. Now, let’s find the tensions in the other two ropes. Note in the illustration how the ceiling rope’s force is broken into its horizontal and vertical components. This will make it easier to add up all our forces along our coordinate system. First, look at the forces along the vertical axis. The vertical component of T1 is pulling the knot in the positive y-direction while T3 is pulling the knot down in the negative y-direction. 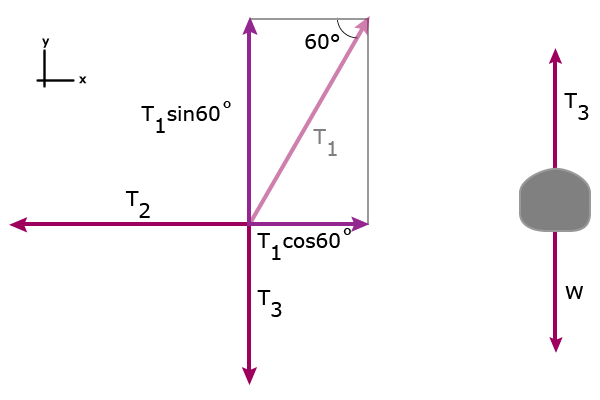 The vertical component of T1 is T1sin60°. Again, the knot is stationary and is in equilibrium so the sum of the forces equals zero. Two tensions down and one to go. For the final tension, look at the forces acting along the horizontal axis. 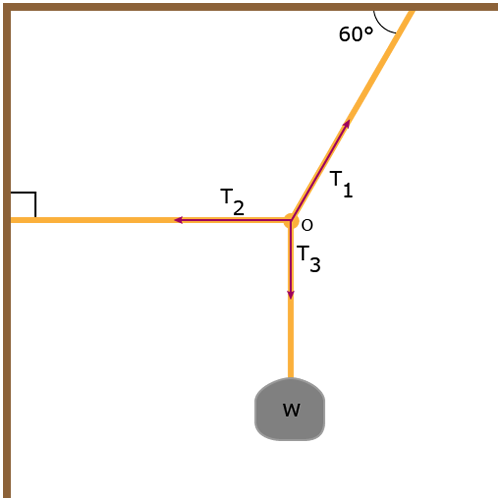 The T1 horizontal component is pulling the knot in the positive x-direction while T2 is pulling in the negative x-direction. The horizontal component of T1 is T1cos60°. Since the knot is stationary, the knot is in equilibrium and ΣFx = 0. We know from above that T1 = (1.155)w. Plug this into the equation for T1. Now we know all the tensions in the ropes. The problem specifically asked for the tension in the ceiling rope. The ceiling rope was the T1 rope and T1 = 115.5 N.
The key to this type of problem is to isolate your systems and locate all the forces acting on individual parts. Since the system is in equilibrium, the sum of all these forces will be equal to zero. Find the magnitude of the forces provided by the supports A and B if shown a balance condition. Weight of the plank is 500N and uniform in shape . Hi. Can u tell me where did u get Tension 1 that’s equal to 1.155w? i’m really confused. Thankyou.